This image appears in African American Art, plate 90. 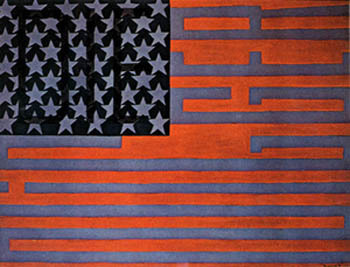 Ringgold was born in New York City in 1934. She studied at the City College of New York where she received her B.S. in 1955 and her M.F.A. in 1959. She is presently a Professor in the Visual Arts Department at the University of California in San Diego, CA. Her work today inlcudes painted story quilts and children's sotry illustations. During the Black Arts Movement, Rinngold used her art to protest racism and gender inequality. In 1971, she became a founding member of "Where We At" a black woman's artists' collective organized to lend visibility to African American visual art and to reconcile the exclusion of women artists from all-male collectives.